One of the main purposes of the Art Gallery Hub is to help you master your site's performance via step-by-step changes. Even if these tweeks seem irrelevant when taken individually, over time all these improvements add up and result in a major make-over that goes even more smoothly than you ever could imagine. Step-by-step tweeking and fine tuning, demands discipline and patience while we are used to see instant results. Yet, it is an attitude you need to adopt. Exactly the same way you have learned to read, write, swim, play the piano, ride a bicyle, drive a car, send a sms or an email ... . There's no rocket science involved. But even at this pace there will be plenty of moments when you will feel uncertain. There are a myriad of characteristics in the contemporary art world that have a decisive, limiting influence on your on-line presence. The web is quite different. It is based on openness, sharing information, interaction with your visitors. It demands a completely different attitude. For a lot of gallery dealers this is the most difficult obstacle to take. Yet, if you want to benefit fully from the opportunities the web offers, it takes some audacity to step away from the conventional approach adopted by almost all galleries. 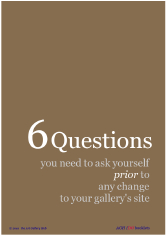 As different types of galleries have varying challenges.To remain comfortable during the change you must be able to select an approach that corresponds to your needs. The right balance between your needs and your wants. This is why before we decide to work together, we will take the necessary time to find the option that corresponds best to your expectations. I could not possibly elaborate here in detail. I can only assure you that I will always try to answer your expectations as closely as possible. I invite you to read more on the approach I follow in the sub-menu before you go see the different types of consulting options I offer. P.S. Do you want some more personal info first?